So, where did I leave you? With the screams and and cries for help that accompanied our journey out of Zion Valley on Utah's beautiful winding Highway 9, I think. Peace returned as we reached the green fields of the High Plateaus of Colorado (in Utah). The road snaked along the Long Valley though peaceful Mormon towns and their immaculately clean and tidy farms. 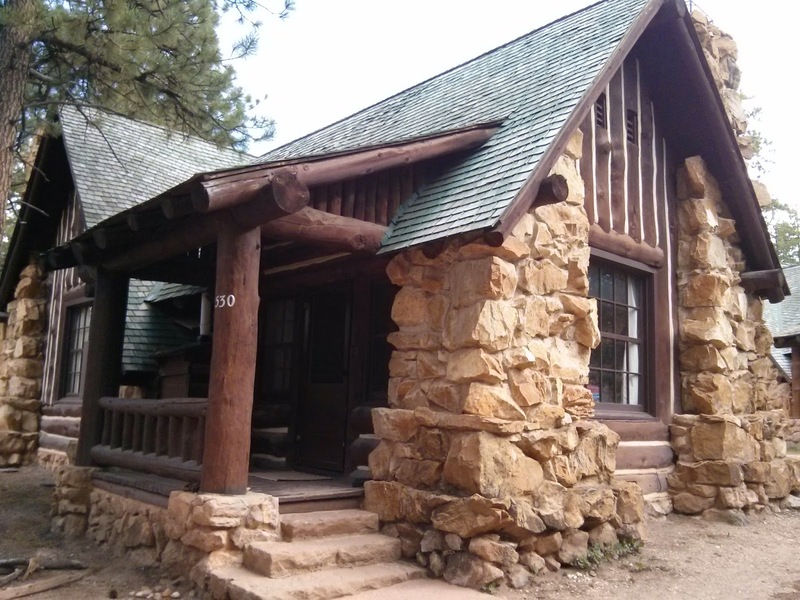 We arrived at Bryce Canyon Lodge in the late afternoon, checked in and retired to our delightful little cabin. The Lodge was state of the art holiday accommodation in the 1920s - a smaller example of what we would see later at the Grand Canyon - and although a little faded and scuffed around the edges now, it still has considerable charm. We stayed in one of the cabins - no TV, no internet - dotted around the site among the trees. There's definitely a story to be told about America's early tourist industry, when places like this were hugely popular - I'll do some research, so watch this space. 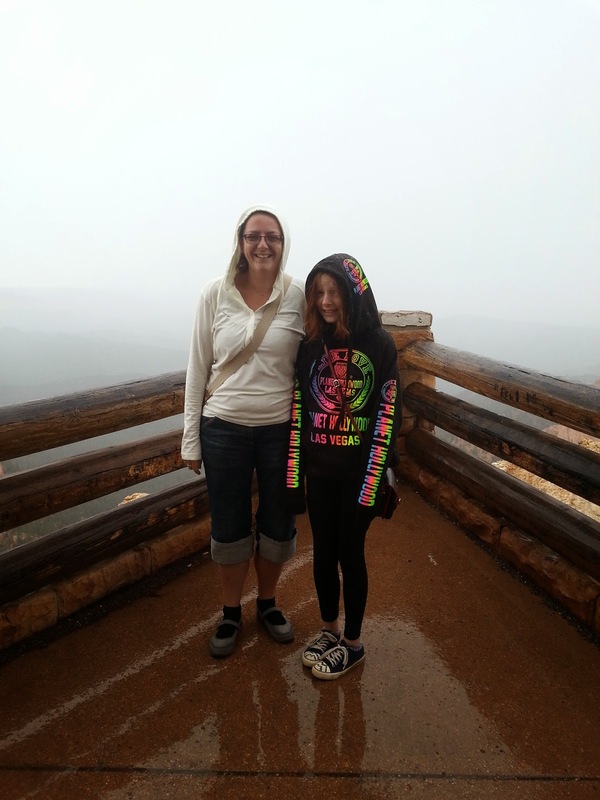 We didn't really know what to expect from Bryce Canyon - we certainly didn't expect the most famous view, the Amphitheatre, to be just yards from our cabin. A short walk through the woods, then a clearing, then wow! Especially beautiful as the sun started to drop. 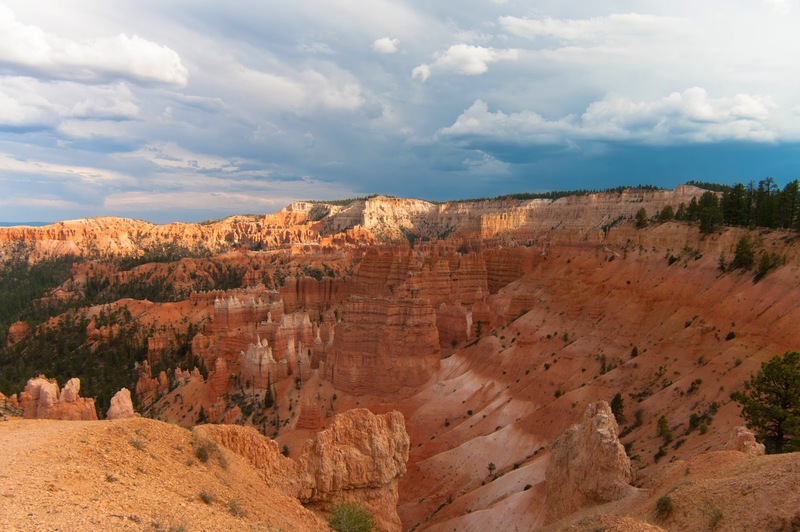 Now, technically, Bryce isn't a canyon, but a collection of 'amphitheatres' - we're now at the edge of the sandstone that makes up the plateau, which water and ice erosion have eroded into curved half-bowls, full of hoodoos, towering spires of rock. The effect is like looking over the edge of a cliff into a forest of giant red-orange totem poles. It proved hard to photograph, and capture the scale of what we're looking at - especially as I was forever being admonished for standing too close to the edge. The failing light and the thunderstorm in the distance sent us inside, in search of food. As we discovered both here and at the Grand Canyon, the food inside the National Parks is more about refuelling exhausted hikers than entertaining English foodies like us. The food was cheap, old fashioned - I hesitate to say 'school dinners', but perhaps just a little institutional. At Bryce we opted for pizza - freshly and enthusiastically made and slightly amateurish, served in a brightly lit hut a little distance from the main Lodge. We drank warm red wine from plastic beakers. I'm sure, if we'd spent the whole day hiking through the hoodoos, it would be just what needed. During dinner the storm we'd spied in the distance arrived, quite dramatically - now I do love a good storm, but this one did ruin one of the treats of Bryce for me. The Lodge is one of only a handful of 'dark skies' parks in the US, where light pollution is kept to an absolutely minimum, and the night sky views are apparently unparalleled. Well, alas, for me, the skies were a uniform grey and not a star was to be to seen. It was also frustrating because we'd paid a little extra to stay at the Lodge rather than the much cheaper Best Western just outside the park. That said, it was still a charming place to visit. The next day the weather was, quite frankly, awful as we bundled back in the car to explore the rest of Bryce. Leading away from the Lodge is a 20 mile or so one way drive to various rain blasted view points - we'd stop, dash out in the deluge to take a photo or two, then race back to the car. As the road climbed to the final viewpoint, the visibility dropped, but it was obvious we were traversing a narrow ridge with sheer drops on either side - much to the pleasure of my more nervous passengers. I'm not sure if the lack of a view helped or hindered - perhaps it's worse when the imagination is given full reign. I'm sure the view from Rainbow Point is spectacular - and we did brave the weather as long as we could, to soak up what we could without becoming completely soaked ourselves. But we were glad to get back in the car and head back to civilisation. It's at this point things starting to go wrong. We had a minor medical emergency (and because this is a food blog, and you might be eating, I won't tell you what went wrong, save to say that it was icky), and that meant a 50 mile round trip to the charmingly named Panguitch. If that had a little silver lining, it was that it gave us a chance to see a little bit of small-town America we would normally have bypassed. 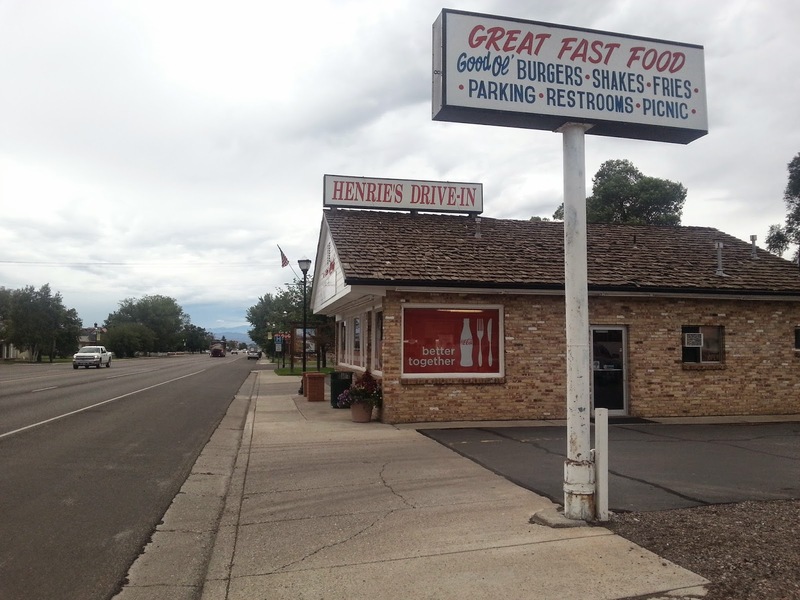 We had lunch at an authentic little local's diner (Henrie's, home of the Chubby Cheese!) and explored the General Store that really did have a bit of everything (including a much needed and very helpful pharmacy). After all that excitement, we headed back to Bryce, eager to put our feet up at the Best Western and dry out and relax. Ah. My first and only booking error of the holiday (don't forget I had twenty one to organise). When I'd tried to book the hotel in Bryce, I hadn't noticed the hotel was full, and it had instead recommended the next nearest, in Cedar City, over 70 miles away. Well, the staff in Bryce's Best Western couldn't have been more helpful - one tried everything she could to find us something closer, while Jennifer went all dreamy eyed at the mere mention of Cedar City. It was the nearest real town, it had shops, it had restaurants, it had (gasp) a Wal Mart. We could tell Jennifer was jealous of our unexpected side trip to real civilisation. Five Guys come to Cambridge - A Review.